The SCVYO family of ensembles strives to provide the highest quality music education in the greater Los Angeles area. We do this by providing the finest staff, with a combined teaching experience of more than 100 years and six graduate level degrees. This set of ensembles takes the beginning players through advanced musicians, laying a solid foundation of correct instrumental technique, rehearsal etiquette, and practice skills. Students graduate from the program knowing how to prepare music to the highest level. We do this by firmly but reasonably demanding a commitment to a very high level of performance. This means that the ensembles become a part of your life. You will meet like-minded, musical and intellectual friends that you will have for life. The SCVYO attracts the best and brightest students from the area, and virtually all of them graduate to prestigious 4-year universities. These include Juilliard, New England Conservatory, Harvard, Northwestern, Yale, Stanford, UC Berkeley, USC, and UCLA, among others. Being an orchestral musician teaches commitment, higher brain function, critical thinking, interpersonal skills and provides a love of the arts for life. This is not an easy path, but it will be one of the most rewarding commitments a young musician will ever make. Derrick brings this passion, talent and vision to his work with the musicians of the Santa Clarita Valley Youth Orchestra, as we launch Novae Sinfonia, the SCVYO'S newest ensemble, which embodies the crossover between New World and non-Western styles with the traditional classical musical genre. This is the cutting edge and future of classical music. We are honored to have Derrick spearheading this new musical frontier with our students. Violinist and violist, Julissa Bozman, maintains a busy teaching schedule in her private studio and as a string coach for different organizations. She is the Strings Chair of the Music Teachers’ Association of California, Santa Clarita Branch, and the director of the Prelude Strings at College of the Canyons. Mrs. Bozman also freelances in the greater Los Angeles area, where she collaborates in original projects, performs with symphony orchestras and other ensembles, and exposes young children to music via school assemblies. She also enjoys performing traditional genres such such as Latin American, Irish and Jewish music. She travelled the United States as part of John Tesh’ Discovery Tour. Mrs. Bozman started her musical training in her native country, El Salvador, where she joined the National Symphony Orchestra at age 15. She continued her studies in the United States as a Fulbright Scholar. She holds degrees in performance from the California Institute of the Arts and from the University of California at Irvine. Having worked on many records for major and indi labels Jim understands both sides of the recording studio and regularly works on recording projects for various artists. Labels that Jim has credit on include Virgin, Columbia and Metal God Records, to name a few. 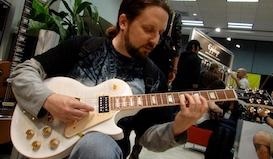 Jim is available for studio and live projects as well as clinics and private lessons. Susan Carpenter is a multi-instrumentalist, music teacher and performer. She holds five University degrees including two Master of Art degrees in Higher Education and Educational Psychology, and three Bachelor degrees in Arts (English), Honors Music Education and Education. Susan has had a prolific music teaching career spanning group keyboard classes, Grade 7 and 8 band, elementary school music classes and private lessons. Susan was awarded the Member of the Year Award in 2014 by the Music Teacher Assocation of California's Santa Clarita Valley Branch for her community outreach service organizing nursing home and mall concerts and their music student service league. Jennie Brent is a cellist and educator from New Haven, CT. She studied with Ole Akahoshi at Manhattan School of Music Pre-college, Peter Wiley at Bard College Conservatory, and Julia Lichten at Manhattan School of Music. Jennie is a passionate chamber musician and was a member of the Annellie String Trio for over a decade. She has performed in venues such as Steinway Hall, Merkin Hall, Carnegie Hall and Beijing Central Conservatory of Music. She has attended a number of music festivals including Aspen Music Festival, Heifetz International Music Institute, Sejong International Music Festival, and the Juilliard String Quartet Seminar. Jennie is a dedicated, Suzuki-certified cello teacher and has been teaching privately for many years, as well as at the Harmony Program in New York City, Festival de Música in San Juán de Colón, Venezuela, the Josiah Quincy Youth Orchestra Program, and Bridge Boston Charter School. She is certified in a method of early-childhood music education, Music Learning Theory, which she has taught at Horizons for Homeless Children and Head Start. From 2017-2018, she served as Co-Artistic Director, Co-Education Coordinator, and cellist of Palaver Strings, a non-profit string ensemble based in Boston, MA. In addition to music, Jennie is a certified yoga instructor and loves to explore the ways that music and body awareness can overlap and serve one another. The SCVYO is thrilled to welcome Jennie to our Artistic Staff for the Summer 2019 Session. Students will participate in an exciting program that integrates music, body awareness and mindfulness. They will be encouraged to approach their musicianship in new ways, finding connections between physical and emotional states, individual expression, and collaborative skills.